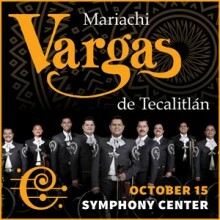 Mariachi Vargas’ classic sound has captured the hearts of audiences everywhere for generations, earning the group the title “Greatest Mariachi in the World.” Don’t miss a “spirited, virtuosic and joyful” (The Ann Arbor News) performance that will captivate you from the first notes to the very last. Come early to Symphony Center and hear students from the Chicago Mariachi Project’s Mariachi Academy perform in the first-floor rotunda. The performance will be from 2:15:-2:45 p.m. Free to all ticket holders. Founded in 1898, Mariachi Vargas de Tecalitlán remains the bulwark of Mexico’s folkloric music legacy. Over its long history, it has played behind the greats of ranchera music, including Pedro Infante, José Alfredo Jiménez, Lola Beltrán and more recently, Juan Gabriel. The quintessential Mexican folk genre, rancheras can be set to a bolero, polka or waltz arrangement. Whatever the format, ranchera music is about passion, especially love of country and longings of the heart. Visit LatinoScoop on social for a chance to win a pair of VIP tickets! Follow LatinoScoop via the links below. ONE follower will be randomly selected and receive a pair of tickets and a Meet & Greet.